Previously releasing her self-titled debut and sophomore album Forever After in 2011 and 2014 respectively, as well as a deluxe edition of her debut album in 2013; CCM/pop/hip-hop vocalist V. Rose has now signed to Inpop Records. An artist who is authentic and passionate, as well as baring her soul and her everything in her lyrics, what has drawn me to V’s songs is honesty and raw emotion. Releasing Young Dangerous Heart recently, this thirteen track album, in my opinion, is all you would expect from a V. Rose album and more, with plenty of musical diversity, guest vocals, and inspiring lyrical moments all throughout. With her sound not really changing that drastically from when she was attached to Clear Sight Music; V, who rose to fame prior to her albums from being a guest vocal on many of Flame’s songs, is sure to soar and rise to fame from this new full length album, and I definitely encourage you all to check out her music if you haven’t before! And for those who are sceptical, of how a rap artist could possibly make it on a CCM label; let’s dive in and see if this album is really vintage V. Rose or not. A glance down the track list reveals a few familiar melodies. 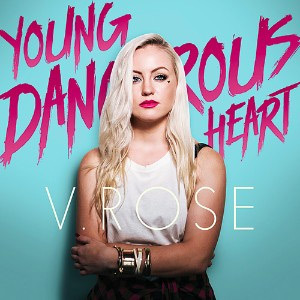 In fact, four of the thirteen songs were previously featured on V. Rose’s label debut EP Hearts Up. The explosive, upbeat and bouncy “Fairy Tale Ending”, driven by synth and groovy electric guitars, was one of the catchiest songs on the EP (and still is catchy when listening to on the album! ), as V passionately and fervently describes her relationship with God through metaphors, reiterating that life with God is better than any ending on any fairy tale, that ‘…right here with You is where I’m gonna stay, they can try to, but can’t take you away…’. Implying that every day is amazing with God on our side; V’s bubbly optimism and joy is thoroughly contagious. V’s first single with Inpop Records- “Love Shaped Heart”, also brings us joy and cheerfulness. A mid-tempo inspirational keys led ballad, V ardently outlines that we all have worth in Jesus, and that how we see ourselves right now (either dictated through our circumstances or on our mood) doesn’t need to be how we view ourselves in the future. Highlighting that we all or beautiful and perfect in God’s eyes, V encourages us to ‘…just let it go, go, cause you’re worth more than you know, let the world see who you are cause I can tell you have a love shaped heart; so let it flow, you’re beautiful so let it show, feel the fire from the spark cause I can tell you have a love shaped heart…’-a refrain and chorus bound to bring healing and reassurance to all and any who listen to this motivational melody. The semi-autobiographical “Bottom To The Top” is a big booming epic grandiose synth driven anthem outlining God’s faithfulness and promise over her life, as V entered into the music industry, and was presented with a chance to influence people’s lives- God’s calling on her life. It’s interesting to hear an artist speak or sing about their own journey, and V. Rose accomplishes this subject with such skilfulness, tactfulness and professionalism. Yet in my opinion, the last track we all have listened to before- the gospel infused synth led electronic dance mid-tempo melody “Take A Broken Heart”- is what brings the album down. Again utilising the theme of surrendering fully to Jesus (nothing wrong with that theme at all! ), V declares that God can take her broken heart away and replace it with something better aka Jesus’ love and unconditional acceptance. But it is the music that seems detracting, as the song diverges from the verse/chorus/verse/chorus mould in the middle, and becomes more experimental. Left field and out of the box, V does deserve kudos for trying something new, but in my opinion this hasn’t worked, and it’s unfortunate that the ‘duet’ with Derek Minor is the album opener. But the remainder of the album more than makes up for this ‘mishap’! Second single “Sinking Deep” is the lone cover on the album, recorded previously by Hillsong Young And Free, and is a gem of a song, with V travelling out of her comfort zone in terms of genre. Set against a serene backdrop of keys and guitars, V exquisitely and passionately recounts her immense love of Jesus, declaring ‘…I’m wide awake, drawing close, stirred by grace, and all my heart is Yours, all fear removed, I breathe You in, I lean into Your love, oh, Your love…’. Led by a full band and inspiring keys, V’s attempt at worship deserves congratulations, as she totally owns this rendition and ‘knocks it out of the park’ so to speak. Recounting that being in Jesus’ presence is so amazing, this worship melody may seem like the odd song out in a sea of rap/pop tunes of V’s, but I reckon it’s a smart move to place this song into the track list, as it brilliantly conveys V’s love for Jesus, and heart for the album, to draw people to our Lord and Saviour. If you’re a bit apprehensive after listening to the Hillsong Y&F cover, fear not, as the rap and pop are still evident and present within the remaining new tracks, while V also encompasses a few more ballads as well for good variety- the rest of the 8 newly recorded tracks beautifully highlight to us a young woman on fire for Jesus, as she brings forth real issues we all need to think about! Anthemic ballad “Storms”, which follows “Sinking Deep” on the track list, carries on the theme of God carrying us in the storm, as V presents hopefulness and unbridled emotion in a 3-minute synth and keys driven potential future single, crying out that ‘…for every valley walked before, You hold me for a thousand more, through every fire, every war, when thunder roars, I’m sure You still the storms…’; while the soft and reflective “Not Afraid Of The Midnight” includes lyrics similar to the Cinderella fairytale, which essentially is a parallel of God being our ultimate lover and friend- the One who will wake us up from our ‘slumber’ after midnight. With V boldly declaring that she isn’t afraid implies that she trusts God with every part of His plan. Seeing that V rose to fame through being a guest vocal on numerous songs with rapper Flame, it’s only fitting that there are quite a few songs on Young Dangerous Heart with guest vocals present. Besides a duet with Derek Minor, V teams up with Flame (Money$ on You), Trip Lee (I Love You So Much) and Angie Rose (We’re Girls), and the result are three smash hits in my opinion. “Money$ On You” lyrically is about surrendering to Jesus completely, and trusting Him completely to the point where we can metaphorically put money on Him because of His promises and faithfulness, as V and Flame majestically trade vocals amongst electronic drums and heavy synth and remix effects; while probably the heaviest rap song on the album is “I Love You So Much”, featuring plenty of rhyme and repetition, as V and Trip ardently describe their love for Jesus, highlighting that their love for Him knows no bounds and extends past everything else we hold dear on this earth. Final collaboration “We’re Girls” is musically very busy, with a frenzied and energetic atmosphere and high octane tempo, as V and Angie vibrantly direct the heartfelt melody at teen girls and young girls, with the intention of encouraging them, that God loves them the way that they are, and that they shouldn’t change despite anything the world says or tells them. I know that the song is about girls, but I guess it could apply to guys like myself as well, as I walk into the plan that God has for me, not listening to the voices around me who may persuade me to try another path. Confronting pop melody “If I Don’t Have Love” is driven by light electronics and pulsating drum beats where V dives in and questions our motivations behind why we all fill our lives with material possessions. Concluding that love is the key to happiness, this song is somewhat inspired by 1 Corinthians 13, and thematically similar to for KING & COUNTRY’s “Proof Of Your Love”, as V sings out that ‘…I could get a mansion on top of the world, and I could have it all yeah, diamonds and pearls, be so rich and famous, you’d think that’d be enough, but none of that matters if I don’t have love…’, a timely reminder of ensuring that we all focus on what is important in life than what is transient. “Emotionful” is heavy with electronic beats, and sounds similar to computer or console games- musically it’s a trip down memory lane as I remember playing computer games and expressing my emotions through fictional characters. Similar to this fact, V outlines how we ought to keep out feelings and emotions in check (obviously with God’s help!) and ensure that we think before we speak when we’re feeling angry or mad. Yet it is in the album closer, the acoustic guitar prominent, finger clicking, contemplative and reflective ballad that is the title track, that brings the overall theme of the album to the fore. As V cheerfully and passionately reiterates that ‘…I’ve got a young dangerous, young dangerous, young dangerous heart, they can tell me no but they don’t even know the road I’ve travelled on…’, she highlights the fact that allowing our hearts to be malleable and to be shaped into what God wants us to be is something we all need to strive to be like- to be willing and able to allow God to move during any stage in our lives. To have a young and dangerous heart is to be willing to go where God wants when He wants, and V has displayed this theme all throughout the album of fearlessness and of a big heart for God. And as the album finishes, there’s only one thing to do- press repeat and listen to the album again! According to some critics and listeners, changing labels may have meant that V. Rose needed to change her sound- one of the aspects that made her unique, as she encapsulated pop, CCM, rap, dance, and almost everything else in between (but not metal!). But this album Young Dangerous Heart has only proved the contrary- that V has only expanded her sound, and drawn in a whole lot more listeners. Which is great news as V. Rose continues to bring her vibrant and unique brand of music to the world. As we marvel at what an exquisite singer and songwriter V is, let us sit back and listen to what I believe will be one of my favourite albums of 2016 come the end of the year! Look out world, V is coming, taking it all by storm- these 45 minutes or so of pure pop CCM goodness is proof that she will be a star now and in the many years to come! Previous PostJoel Vaughn – KineticNext PostWow Hits 2017: What’s Your Prediction (Part 3)? Josh, thank you for the interesting review. V. Rose has won herself a new fan as I almost did not want to listen to this album. As if I knew I was go to love it, I listened to it through to the end and I have no regrets about it. As much as I am a fan of Hillsong Y&F, I think V. Rose’s cover of Sinking Deep makes it sound like a new song in a good way. My favorite tracks on this album are Storms, Sinking Deep, Fairy Tale Ending, Not Afraid of the Midnight and Young Dangerous Heart; I don’t know why but the title track reminds me of Hollyn’s Hey Mama song. Maybe it’s just me.